A lot of people is writing Viner don't like Dina and Arina but that’s not true! Russia has an extremely long quarry of gymnasts, it is impossible to Irina Alexandrovna Viner-Usmanova get the most out of each and every one of the girls under her command. This does not mean she does not appreciate Dina and Arina, which has much affection and, as all gymnasts have at her disposal, treat them as if they were her daughters. Dina (pink) and Arina (grey) with Irina Aleksandrovna. Some countries have football as the main sport, others have basketball, swimming pool... Among the most played sports in Russia are gymnastics, ice skating, ice hockey, basketball, bandy and football. Other sports widely practiced in this country include rugby, handball, weightlifting, biathlon, boxing, wrestling, martial arts, volleyball, rugby and skiing. Rhythmic gymnastics is a very "Russian" sport. Rhythmic gymnastics is considered one of the most popular sports in Russia and that’s why it is generally considered that Russia has the best rhythmic gymnasts. Most of the winners of all competitions internationally were Russian citizens. There are many clubs rhythmic gymnastics in Russia and the most famous is the School of Gazprom in which Irina Aleksandrovna Viner-Usmanova trains gymnasts, which is located in Novogorsk, Moscow, where she also coaches the Russian national team. The term "rhythmic gymnastics" appeared in 1934 in the School of Artistic Movement of the Institute of Physical Education P. F. Lesgaft Leningrad. The first teachers were Yelena Gorlova, Roza Varshavskaya, Anastasia Nevinskaya, Zinaida Verbova and Aleksandra Semionova-Naypak. Indeed they contributed to the unification of different streams in a sport gymnastics, rhythmic gymnastics, and gave his knowledge to make it beautiful, elegant and attractive. In 1945 the Union of Gymnastics, which became in 1963 the Federation of this sport was created. The first championship of the USSR was held in 1948 in Leningrad, and the honorary title of the first champion of the Soviet Union received the Moscow citizen Liudmila Zotova. Most of competitions only allow 2 or 3 gymnasts (as maxim) by country as team, like AEONcup in Japan, and that team consist in 2 senior gymnasts and 1 junior. That’s why she can’t send all her girls, the competition don’t allow that. The solution Irina Aleksandrovna Viner-Usmanova has is send her gymnasts to different competitions which are celebrate at the same time in different countries as she did when in 2014 she sent Dina to the Wold Cup in Lisbon (Portugal) and Arina to the Baltic Hoop in Riga (Latvia). Since they were young, both began to show their great physical qualities and able to form part of the talent pool in Russia because Russia has selected promises. 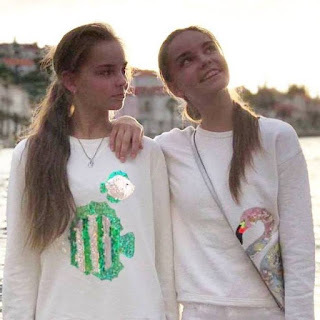 If Irina Aleksandrovna Viner-Usmanova didn’t believe that Dina and Arina have potential in Rhythmic Gymnastics, the twins would not be among her ranks. At the same time, Dina and Arina would not be representing their country as they do, would not athletes as they do and Irina Viner didn't give them new choreographer and she did. So, if Dina and Arina are training in Novogorsk its because Irina Aleksandrovna Viner-Usmanova believes Dina and Arina have potential.